Home / How-To, NITRO Forms / How to modify the default “Save” and “Cancel” buttons in Nitro forms and Portal? How to modify the default “Save” and “Cancel” buttons in Nitro forms and Portal? 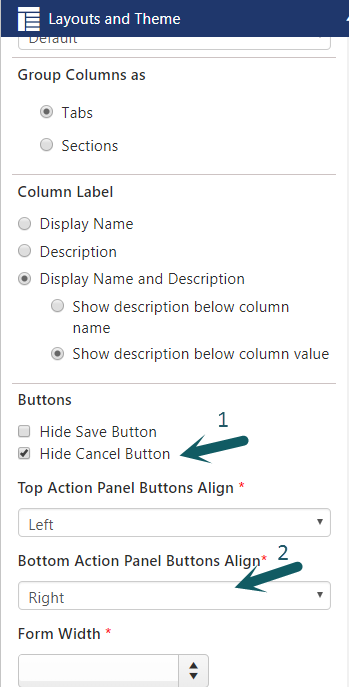 This article describes about how to modify the default “Save” and “Cancel” buttons in NITRO forms and Portal forms and related functionality. How to redirect to custom page URL after submitting the form? 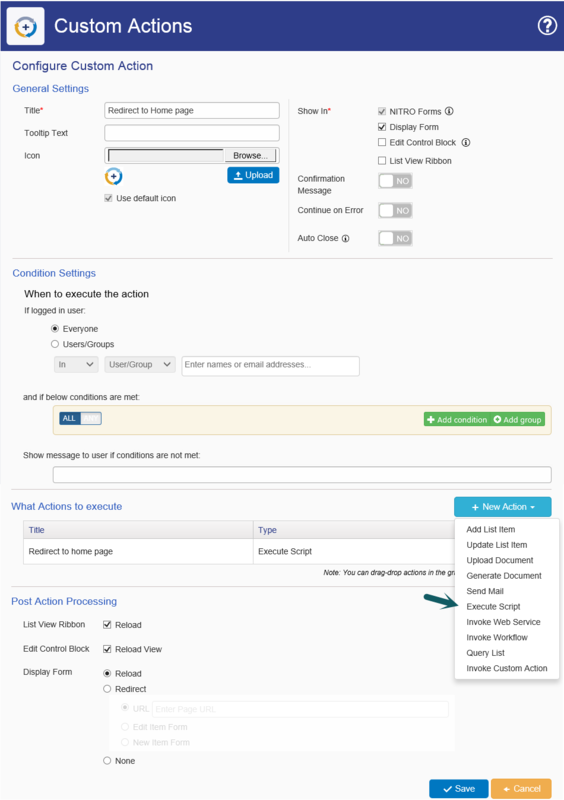 To replace the Save and Cancel buttons, we will use Submit action and Script action buttons in Nitro forms. With these action buttons we can execute the custom script and also we can invoke the configured custom actions in Submit action. This article takes Tickets list as example, you can configure the same on any list. Rename Button Title to “Submit work Order” –> enter “functionCallback();” under Script Function panel under action settings like shown in below image. Hide the “Cancel” button under Layouts and Theme section and insert the “Script Action” button. 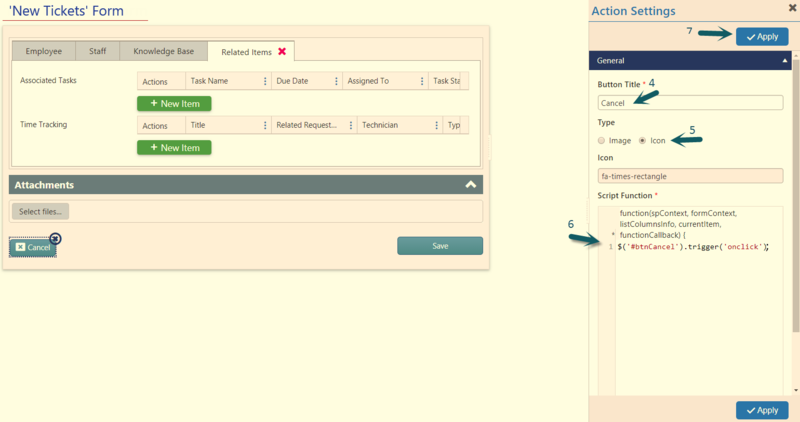 To insert the script action button, drag and drop the Script Action button from “Actions” section to the desired position on the form. Rename the “Cancel” Button Title as required –> enter “$(‘#btnCancel’).trigger(‘onclick’);” under Script Function panel under action settings like shown in below image. How to redirect to a custom URL after submitting the form? 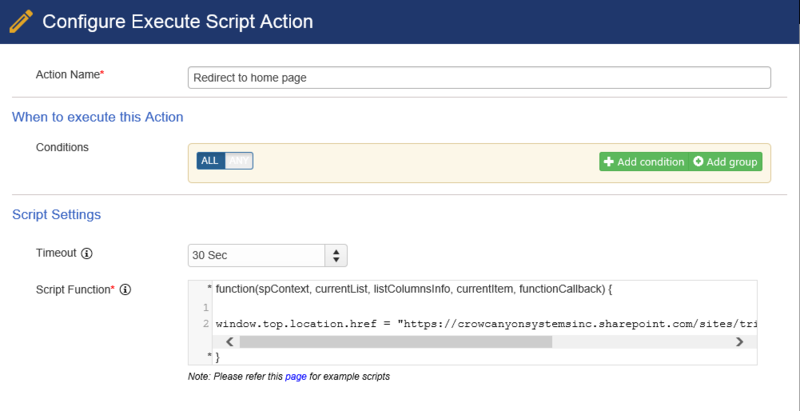 For this we need to configure a script action using Crow Canyon Custom Actions App and then invoke the custom action in Submit action from Nitro form. Go to Tickets list –> List Settings –> Crow Canyon Nitro Forms –> Configure “Submit Action” in New/Edit form as required and onfigure the action button like shown below. Note: Please refer instruction to add Submit Action button to the form from “Save button text change” section in this article. To show this “Submit Work Order” action button only for the specific group of people, we can configure permissions for the action button. 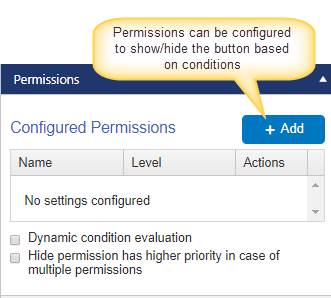 Select the button, go to permissions section and configure the permissions as required.